This has been a talking point already, are they lying about the weight, what corners have they cut, is it really a Berghaus logo on there. 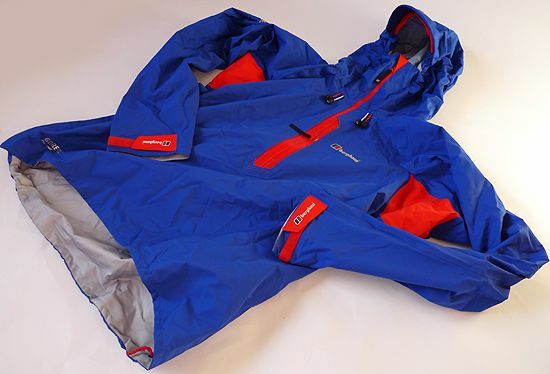 Let’s see, in for test the Berghaus Asgard Smock from the top-end tech MtnHaus range. The inspiration and design input for the smock are well covered already, but all that means nothing when you pull it on in the shop to see what the score is, it has to stand on it’s on two velcro adjustable cuffs. Talking of which, it’s a lightweight smock with adjustable cuffs, no wrestling to tuck your gloves or mitts in here. The finish is nice too, slightly assymetric, the tabs don’t have velcro all the way to the end you you can actually grip them. Neatness is the way elsewhere, the hem adjustment is tucked up with a little elastic loop, although you can let it hang for easy adjustment if you want. It only cinches in the back, to keep the front clean (it’s climbing derived remember), I’ve got no problem with that. Moving up we have a very light and soft Gore-Tex ProShell, and what few seams there are are micro-taped. The elbows are articulated and there are under-arm gussets, this means when you lift an arm, both your arms even, the hem doesn’t budge and the cuffs don’t slide up your wrists. That’s great, but just by tweaking the form it’s been achieved with low bulk, no huge area of loose fabric to make up for sloppy design as is often the case. Below is the only detail on the front, the zips. The main zip and the pocket zip are welded together, with a huge stiffened flap behind them. The premise being that any water gets inside it’ll run down and get captured in a little pocket at the bottom where it’ll then drip out of the holes you can see in the photies below, rather than soak into your other layers. The pocket is stretch mesh, so it would catch some of the moisture, but to be honest I’ve not had a lot of problems with these zips over the years, but I’ll be watching it anyway. The pocket is a decent size for wee bits and pieces, the stretch will allow stuffing to a degree, and it’s bonded on there on the inside, no stitching. The hood is a proper hood, it’ll fit a helmet and the bare head within it. The peak is wired and lightly stiffened, bg for good protection too. Although it has a big volume, this won’t be a tight-fit on a helmet, it cinches down well and will be great over a beanie or a Buff in a blizzard, and that cinching is done in a different way. You’ll see in the photies above red and white drawcords coming out of the neck, the white pulls in the face aperture, the red does volume around the back of your head. No more reaching around and fumbling for an adjuster, just look down and pick a colour. They do take a bit of pulling as there’s a lot of bungee in there to stretch, but it works well. Both cords go through the same cord lock at eye level inside the hood, so slackening-off is done together to keep it simple. 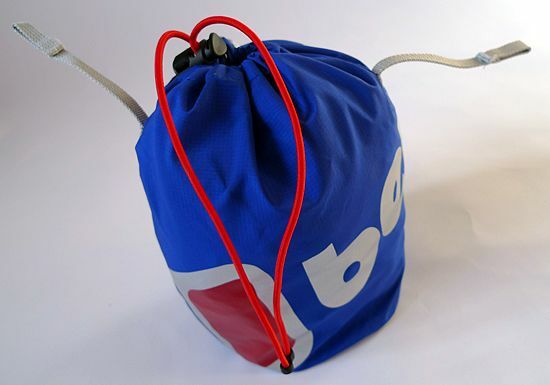 Last up is the ProShell stuffsack with an adjuster and two belt/harness loops to keep it handy when your packless. I’ll cut to the chase here, 290g for a size large. And I can’t see a single compromise to get the weight down, the arms are long, the body’s long, sure it’s a slim fit but it has to be for the users it’s aimed at. It’s designed to be pushed, and to let you move however you want. This is exactly where Berghaus should be, at the front. We’ll be seeing lots of this over winter. I’m likin’ already. NO need for another waterproof tho… at least that’s what I’ll keep telling myself! Ace colours, the hood adjustment sounds interesting as the Raptor hood can fiddly, hopefully that’s an improvement. The hood is only the only thing that I wasn’t so keen on on the Rab Demand. Hopefully they can start using a decent down fill in the insulation pieces… then we’d be talking! There is another choice for a winter shell ! This looks good. Will be checking it out when the Oz needs replacing. I can’t remember the last time I bought a bit of Berghaus kit. Never? I feel a bit sorry for them really – their stuff got hijacked by some different “elements” and put me off forever. That was a long time ago. But then, everything I see of their stuff looks dull and dog-walkery. This though… this actually looks pretty special. 290g for a proshell? I’ve been eyeing the Demand and the new OMM smock but this is now in the mix. I can’t decide if the colour is hideous or awesome. But, in the end, I might just go with the TNF (another brand I normally avoid) Kishtwar and use my LIM Ultimate over the top if the weather gets *really* horrible. I can’t see too many scenarios where I’d need a Kishtwar *and* a Proshell/eVent jacket in winter. The 290g is on my digital scales btw. Interesting comments, nobody is saying “Pah, Berghaus”. Have we accpeted them back into the fold of proper technical brands? It’s too nice to take out in the rain though! Hmmm, be interested to see how it compares to the demand. too late though! Trust me, you’ll not be suffering in your eVent! 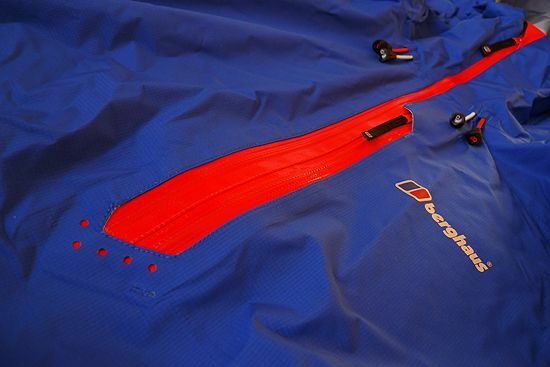 Are Berghaus the only people who know how to make a proper hood? I tried a Berghaus jacket in one of those end of line type stores, I think the model name was Dunedin. The hood was great, vastly better than the Montane Venture (massively too big and doesn’t chinch down) or the ME Morpheus (hood too small, visor does F*** all) too bad as the Morpheus is a nice jacket otherwise. Aye, I remember liking the fit of the Morpheus. I don’t know if the Asgard hood is as good as the hood on the Temperance yet, they’re pretty different. It’s amazing just how different hood designs are, and how rubbish some of them are too. I can almost hear the bhaus suit, using the wonkword “broad portfolio”. They could brand gear as; Plight Series and Summat or other series. Not complaining though, Good luck to them. Do you know what sort of price this will be available for? I’d say RAB also know how to do a hood, was just trying them on today. I also came across this from Trespass today: http://www.trespass.co.uk/product/mens-clothing-1/mens-outerwear-1/waterproof-shells-3/encore-MAJKSKE20057 Was very impressed for £120, I’m just unsure because the fabric is Tres-Tex which I think is there own brand and, well its Trespass. I like to think RAB would do a better job as they’ve got a name to protect. I was just overall impressed by the hood and overall fit of the Trespass jacket and feel it deserves a mention. Do you have any idea how much this Berghaus will cost when it is in the shops? Tried it on and found the fit and hood to be excellent. Just unsure about their own Tres-Tex fabric as I can find little about it on the net; and suspect that RAB’s use of eVent fabric would provide better performance. That jacket does look alright doesn’t it? I wore PU nylon quite happily for years, Tres-Tex is going to better. They’re a Glasgow company you know, I should be supportive of them! Don’t know how much the Asgards is, I’ll find out. I carried it all day today waiting for snow to see how it performed, never happened. Ach.